Jason Giambi gives Orioles outfielder the middle finger after reaching base on a single last night. How does the American Mustache Institute feel now? 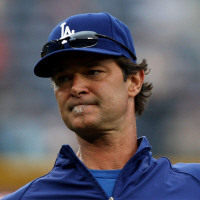 Mustache Hall of Famer, Don Mattingly is now the Los Angeles Dodgers hitting coach, after the All-Star break. Mattingly had some family issues which is why he didn’t take the gig at the start of the season. We’ll see if Joe Torre will develop the magic of the Yankees batting order, reincarnated at Dodger Stadium. Dodgers GM, Ned Coletti announced that he’ll now be replacing Mike Easler, who stepped up for the first half of the season. Now it’s time to play Mr. 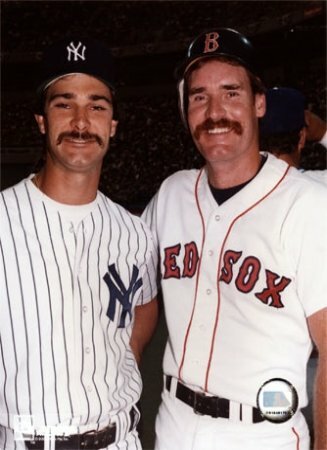 Baseball v. Donnie Baseball v. Wade Boggs. In honor of the American Mustache Institute we’d like to have a vote on the best mustaches of recent baseball memory. This is better than the Affliction Banned show and the odds are 3:1 that Magnum P.I. wins this contest. 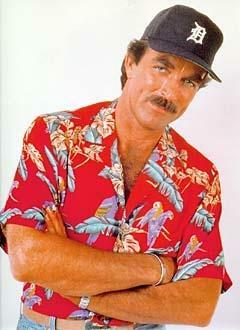 Anyone who rocks a ‘stache and a Hawaiian shirt is a winner in my book. Al Davis Jr. is mindreader, and Luke from the Bushwhackers likes to party. Though the 1980’s Mattingly and Boggs handle bars are classic. 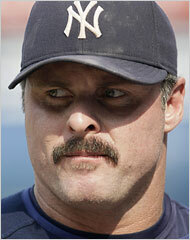 Fanhouse is reporting that the American Mustache Institute endorses Jason Giambi for his amazing mustache. The team doesn’t allow any facial hair below the lip, per Mr. Steinbrenner’s edict. That being said, the Yankees gave away 20,000 fake mustaches to fans who attended last night’s game. Personally, we back the ‘stache. Who thought there was a relationship between a handlebar mustache and intellect?